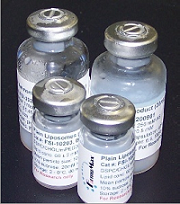 loaded formulations are suitable for either in vitro testing or in vivo studies. solvent, such as ethanol, DMSO and etc. 6. The drug loading is completed. cloudy, it may indicate the drug is over loaded. Reduce the drug/lipid ratio if this happens. so optimization is necessary to determine the maximum drug loading capacity. 7. Conduct the final drug loading at or below the maximum drug/lipid ratio determined.